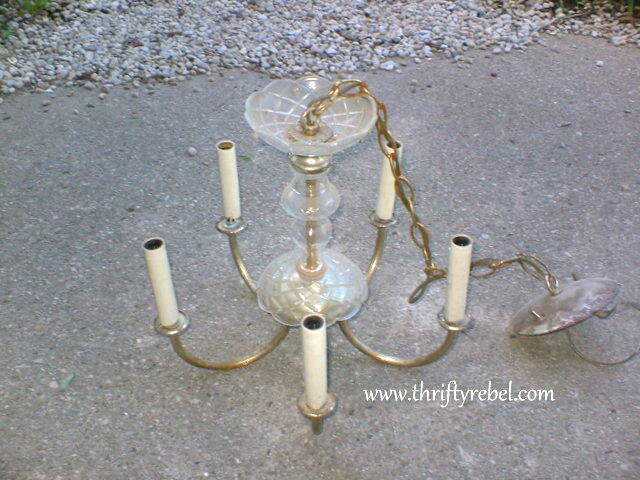 Last week I pulled a rather sad looking chandelier out of my basement, where it has been for about 15 years. It was given to me long before that, but I never hung it anywhere. Truth be told, I’ve never been able to refuse any freebies because I always think I’m going to do something with them, but somehow this just got put away and forgotten. Until now. Here’s the before. 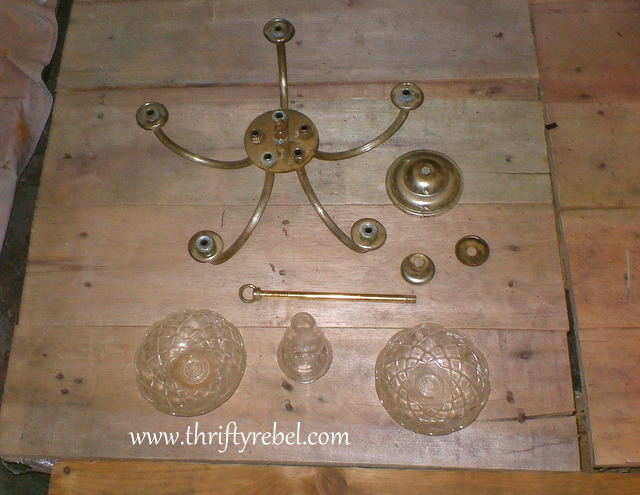 The chandelier was very dirty and the metal had some rusty spots. I removed the hanging crystals long ago and had them stored in my craft room. To remove the bulb sockets I simply bent them until they broke and then I cut the wires. 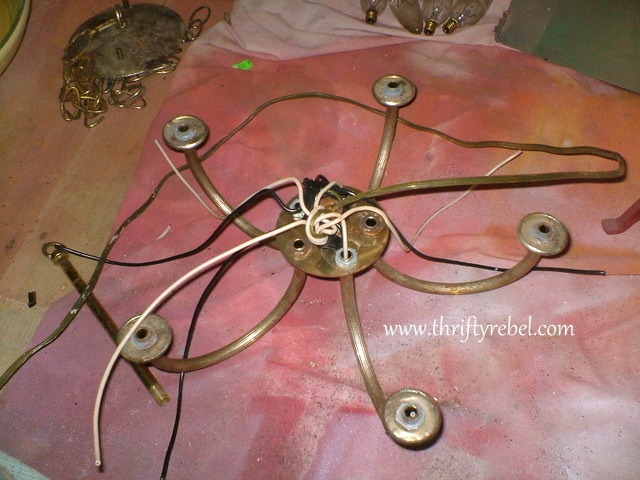 I took the chandelier apart and removed all the wiring. And just like that, a ‘candelier’ was born. I gave all the candelier parts a good wash and lightly sanded the metal parts to get rid of any loose, rusty bits. Thankfully, the rusty spots were just on the surface. 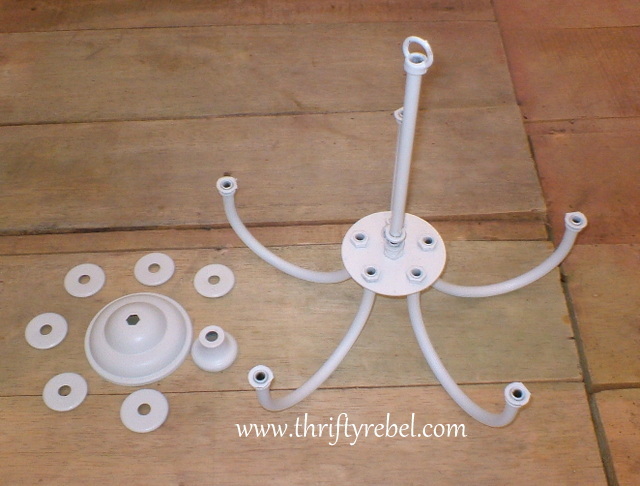 I spray primed the metal parts of the candelier with Rustoleum Ultra Cover, and then spray painted them with a lovely white paint and primer combo. I put the candelier together how I wanted it. Notice the glass bowl on the top is now facing down. This is because this candelier will be hanging outside. 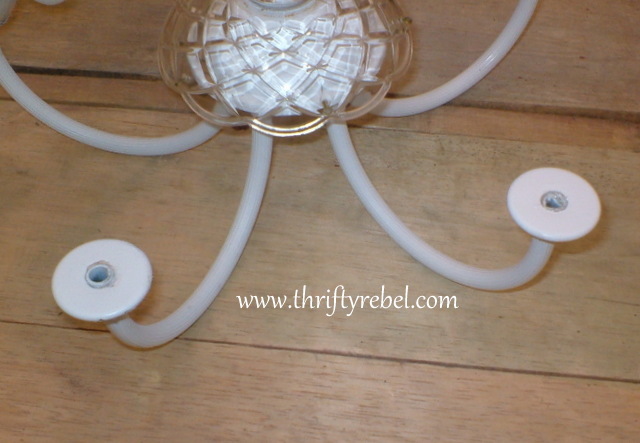 I glued on the discs – that used to hold the bulb sockets – with Marine GOOP adhesive. Using the same adhesive, I glued espresso cups that I thrifted for $1 on to the discs. These charming espresso cups are decorated with french words and because this is a small candelier, they’re the perfect size. These cups are also able to handle the heat of the candles, which is very important. I added the hanging crystals to finish it off. Tea lights fit perfectly inside these espresso cups. So you don’t have to scroll up, here’s the before again. And here’s the after. I just love it. 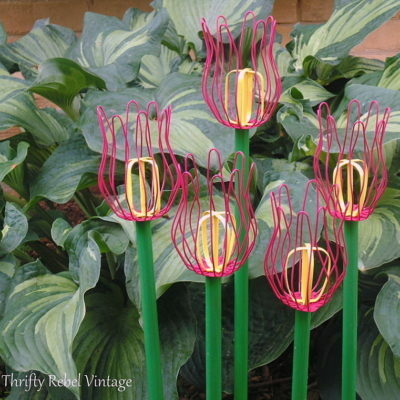 My ugly chandy became garden candy. It’s hanging on the back deck where we can enjoy it every day… and night. It glows beautifully with the candle flames reflecting against the top crystals. Night pics just didn’t do it justice, so I didn’t add any. Here’s where it hangs… with the background of our waterlily pond and waterfall on the left, and ‘Cubby’ the carved wooden Bear on the right. The Autumn Joy sedum to the right is turning more red with every cool night. I just love this time of year. Enjoy it! I certainly plan to. Oh my goodness, Tuula! That is fantastic! I love how you added the cups. It's perfect! It looks great. Thanks so much Cecilia! I really appreciate your comments. Thanks so much for visiting! 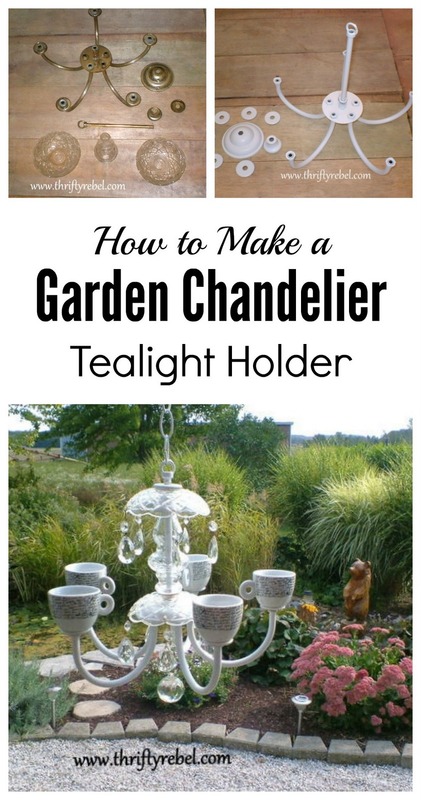 I keep reading about people pulling old dusty chandeliers out of their basements and turning them into something fantastic! 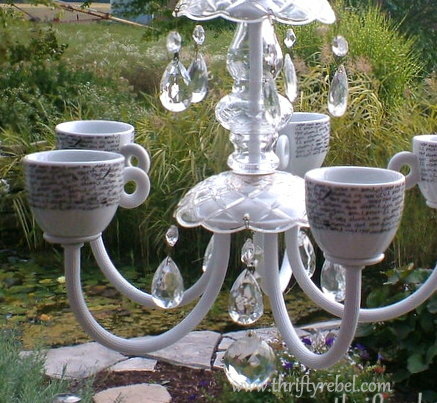 Now if only I could had an old chandy like that! (or a basement for that matter :))! I love what you've done with this…the teacups are just adorbs!!! Beautiful job! WOW! I was amazed of what you did. Good job my friend. I love it much. Amazing project! That turned out really cool! Thanks so much Kate! I appreciate you stopping by and following. Hi Tuula, thanks for stopping over to visit at Quirky Vistas and checking out my vanity makeover and for following. So glad you did so I could find your blog. What a cute idea to make over the fixture that has been sitting around for so long unused, and it turned out adorable. I hope you get a lot of enjoyment out of it! Thanks so much Liz! I really appreciate you following. I just love the vanity makeover you didn and I'm looking forward to seeing your future projects. What an amazing unique transformation – perfect for your gorgeous garden! Great job on the chandy! Beautiful inspiration! Thank you for sharing your project at Potpourri Friday! Thanks so much Honey! You host such a great party! A wonderful project that turned out beautifully! I am bookmarking this to use for next year! Thanks Nancy! I know… it's late in the season isn't it, butI just had to get another summer project in before fall officially arrives. Thanks so much for visiting! I absolutely LOVE this! I would have never thought to put the cups on there… it sure is cute!!! We are now following you! Thanks so much for following Brooke! This turned out GREAT! I have seen these on pinterest but never have seen anyone who ACTUALLY Did it and showed how!! Thanks so much Karin! I appreciate the visit. Luv it!!! Adding that to my to do list! I see it hanging on the back patio and glowing in the twilight. Pop on over and visit me when you get a chance. Thanks so much Gee! I'll definitely be over to check it out. Thanks for following! You did great! I love the teardrop accents & the tea cups! Sooo cute! Please stop by tomorrow & link this cutie up on my blog hop? Thanks so much Nikki! I'll be by to check it out. Thanks for the invite! Thanks Suzy! I'll definitely pop over. Thanks so much for following! This is seriously adorable! Thanks so much for sharing at my party this week. Tuula, Left you a message on Simple & Sweet Fridays. Please try and share this inspiring post again. Hope it works this time. Thanks Jody. I'll pop over to try again. You are a STAR at I Gotta Create! With your own Friday Spotlight Feature! I LOVE your chandelier and having it in the garden sets such an intimate and romantic ambiance. Thanks so much Christina! I really appreciate the feature. It's so great to link up to such a fabulous party. I did one of these too. I enjoy looking at the teacup and saucers and it even glows pretty when the candles are lit. Yours turned out lovely. Thanks so much Terry! On a nice evening I can sit on the back deck just looking at it for quite some time. It's so relaxing. Thanks so much for visiting. So gorgeous I am at a loss for words! I am a huge tea drinker so this appeals in all sorts of ways. Now I just need to find a chandelier I can take apart. . . So glad I found you and your blog and am now happily following you. Have a wonderful weekend and thanks for the inspiration! Thanks so much Maureen! I hope you find a chandelier you can use. We're really enjoying our evenings on the back deck with the ambience of our candelier. Thanks for stopping by and for following. That was one awesome transformation Tuula! Very creative and inspirational! For me, chandy's are like shoes for some women…I can't resist them! Heading over to FB to follow. Glad I found you from LLSD. Thanks Doreen! I have a thing for chandy's too. Mostly for the ones that need help to be lovely again. Thanks so much for following me. I appreciate it. How fun! I've been wanting to do something like this – thanks for the inspiration! You're very welcome Nancy. I'm so glad you like it. Thanks so much for visiting and commenting. I really appreciate it! Thanks Zefi! I'd be so happy if you'd copy mine. Thanks so much or stopping by! Wonderful! I love the idea of repurposing chandeliers in this manner. You did a great job! Thanks for sharing! Thanks so much Carrie! I appreciate the visit, and the comment. 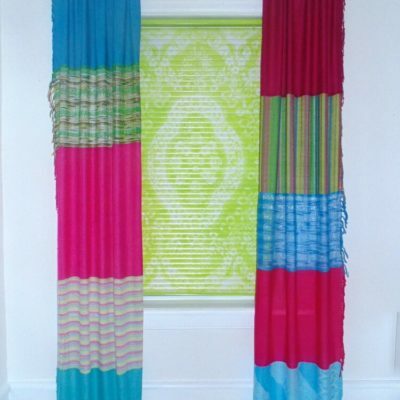 What a great way to reuse something that was drab and make it absolutely FAB! I could see this being a cute little bird bath too! LOVE!! 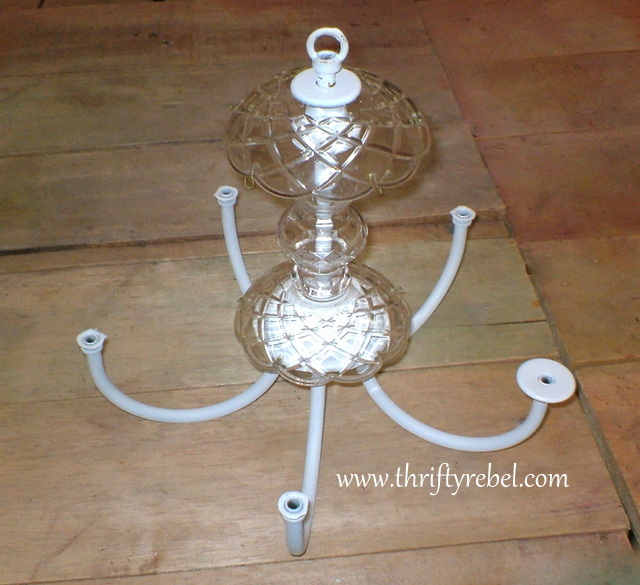 Thanks so much for sharing this beautiful chandelier makeover on Simple & Sweet Fridays. Fantastic job! Thanks so much Jody! I'm happy to participate in such a great party. This is such a cute idea! I'm looking for chandelier ideas, so thanks for the inspiration! Your welcome Val! I'm so pleased that you like it. Thanks so much for stopping by. Thanks so much Kathy! It's a pleasure to join the party. Oh wow! This is so beautiful and goes so well with all of your other pieces. I want to come hang out in your garden! It must be like a Wonderland tea party! 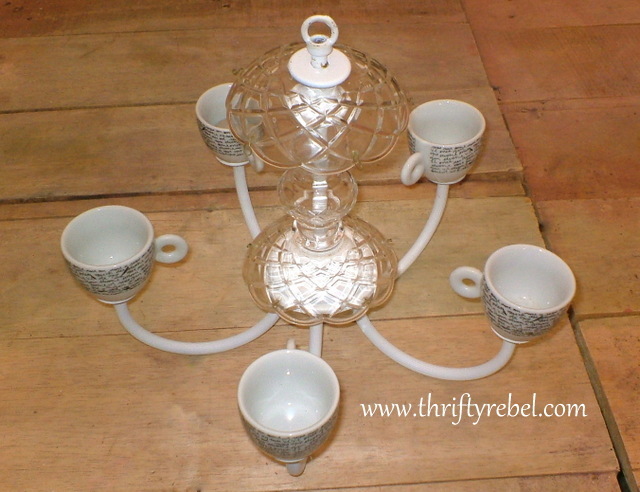 Thanks for sharing your teacup chandelier at Gettin' Krafty this week! Thanks Kathie! We do spend alot of time outside, so I love to sprinkle the gardens with whimsical touches that make us smile. Thanks so much for hosting the party! very pretty tuula! I've done several, but I've never used coffee cups. It's very pretty! That's so great! I'm so excited you'll be featuring my chandy/candy. Thanks very much! Thanks Holly! We're really enjoying it. I hope you get yours done so you can enjoy it on your porch, but I know how it is… so many projects, so little time. lol. Thanks so much for stopping by! Thanks Aimee! I'm just thrilled you're featuring my chandelier. It's always a pleasure to join your party. Thanks again! You definitely worked your magic once again! That is oh so lovely! Thanks you so much! 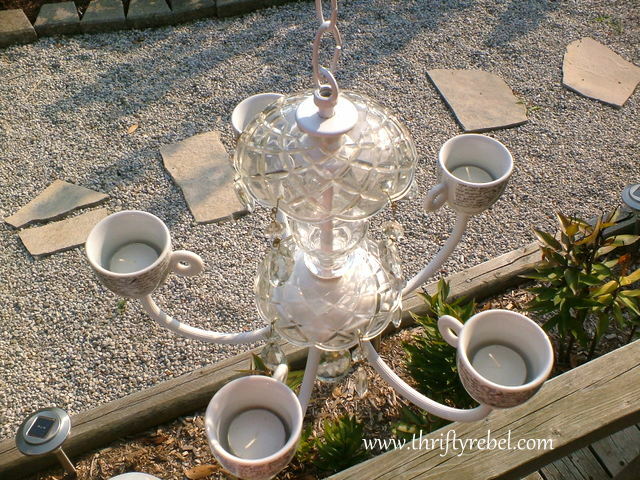 We've really enjoyed our candelier hanging on our back deck. Hope you find one you can use. I appreciate you visiting and commenting. That is really, really neat! Wow, this is such a fun little makeover. 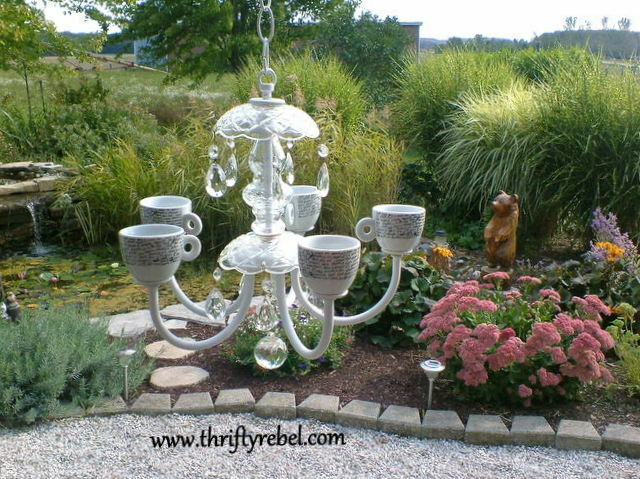 How neat to have a chandelier in your garden! I love the idea of using the teacups. Our Simply Create Link party is going on right now. 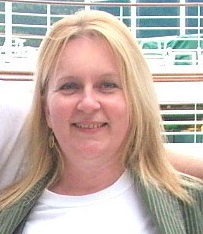 I would love to have you link up, as I'm sure my followers would like to see what you created too. Hope to see you soon!